Enjoy a whole day at your leisure to soak up the unique, indulgent atmosphere of Discovery Cove. Embark on an underwater adventure in Discovery Cove's Grand Reef where you'll snorkel among canyons and come face to face with venomous lionfish and sharp-toothed reef sharks (safely behind massive panoramic windows). Discover the Free-Flight Aviary, just beyond the towering waterfalls, where you can hand-feed tropical birds, relax in the refreshing waters of the Resort Pool and float along the Tropical River. Freshwater Oasis features swimming and wading adventures and face-to-face encounters with playful otters and curious marmosets. Select the Ultimate Dolphin Swim Ticket for a unique opportunity to spend 30 minutes, in groups of no more than 10, getting to know your dolphin through hugs, kisses and ultimately, a one-on-one swim together through the lagoon. Then, you have the rest of the day at your leisure to soak up the unique, indulgent atmosphere. As a reservation-only experience, which is limited to a capacity of 1300 guests a day, it’s a rare opportunity to set your own pace. Offered on an all-inclusive basis with breakfast, lunch, snacks and drinks included nothing is going to tax you… Life is good! It’s all about a day of wonderful discovery and a lifetime of memories at Discovery Cove Orlando. PLEASE NOTE: Those wishing to swim with Dolphins must purchase the Ultimate Dolphin Swim ticket. If you just want to accompany friends and family who are swimming with dolphins, purchase the Ultimate Non-Dolphin Swim Ticket. This includes all the same elements, except the Dolphin Interaction Session. You must be at least 6 years old to swim with dolphins. Children between 6-12 years old participating in the dolphin swim experience must be accompanied by an adult who also is participating in the dolphin swim experience. There is no minimum adult to child ratio, so one adult can accompany more than one child. Discovery Cove is a reservation only experience and you must choose the date you wish to visit at the time of booking. You must purchase the Ultimate Dolphin Swim ticket if you wish to swim with Dolphins. Children between 6-12 years old participating in the dolphin swim experience must be accompanied by an adult who also is participating in the dolphin swim experience. There is no minimum adult to child ratio, so one adult can accompany more than one child. 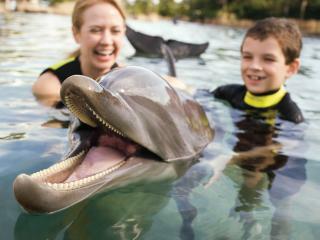 Visits to SeaWorld® Orlando, Aquatica® and Busch Gardens® may be taken before or after your visit to Discovery Cove. All bookings for Discovery Cove are subject to 100% cancellation fees within 30 days of your booked visit. There can be no refunds for amendments (for example to change from Swim to Non Swim) or cancellations within this period. Do I have to book a date or can I leave it open? Because Discovery Cove limit attendance to 1300 people per day, we have to book a date for you. During busy periods such as Easter and Summer, we would require at least 2 months notice in order to secure you a place. Do you need to be an experienced swimmer for Discovery Cove? No, life jackets are provided and you don't have to go out of your depth. How long is the dolphin swim? The swim will consist of a 10-15 minute introduction with the trainers and a 30 minute in-water group session with the dolphins. This will be followed by an optional 30 minute debrief for any questions. Does the Discovery Cove Ultimate Package also include a pass to SeaWorld, Aquatica and Busch Gardens? Yes, the Discovery Cove Ultimate Package includes 14 consecutive days unlimited admission to SeaWorld, Aquatica and Busch Gardens, the complete SeaWorld Parks experience! The 14 days start the first time you visit any of the parks including Discovery Cove. To swim with the dolphins, guests must be at least 6 years old. Are children allowed to participate in the dolphin swim without their parents present? Children between 6-12 years old participating in the dolphin swim experience must be accompanied by an adult who also is participating in the dolphin swim experience. Any minor under the age of 18 years participating in the dolphin swim experience must have a “Minor” waiver completed by a parent or legal guardian. If a parent is not present at check in, they will need to complete a liability release form prior to the day at Discovery Cove and those accompanying the child will need to bring the completed form as well as a photo copy of the parent’s Driving License or Passport to verify their signature. Please contact us should you need a form sent with your Discovery Cove documents. Park operating hours are 9.00am to 5.30pm. Check-in begins at 8.00am. We recommend arriving early so you can enjoy a full day at this beautiful park. Is the dolphin swim available to guests with disabilities? Discovery Cove can accommodate guests with disabilities who are able to manoeuvre themselves with limited assistance (or with the aid of a personal assistant) during their dolphin experience and in the various wading locations. Can I use normal suncream At Discovery Cove? No. Specially formulated sun tan lotion, that is safe for the animals’ habitats, will be available. Please leave your sunscreen at home. Does Discovery Cove Ultimate include transportation to Busch Gardens Tampa Bay? Free transportation to Busch Gardens Tampa Bay on the Busch Gardens Shuttle Express is included in Discovery Cove Ultimate. The service departs from SeaWorld® Orlando and throughout various locations in the International Drive and Kissimmee areas. Pre-booking is a must and reservations can be made by calling 1-800-221-1339. The service is subject to change. Can i prebook a Cabana at Discovery Cove? Yes but this must be done directly with Discovery Cove. Once your ticket is confirmed we will send you a Discovery Cove booking reference. When contacting Discovery Cove, give them this reference who will then link the cabana to your tickets.